Martha writes to Miss Morten that it's against school policy for individual students to get gifts or letters from friends outside the school. But they will be happy to have anything sent at Christmas to be gifts for the students. 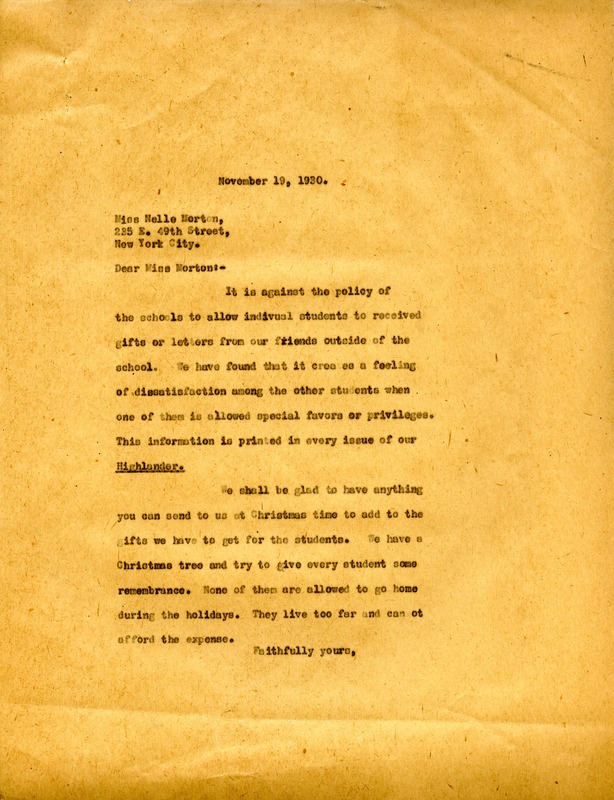 Miss Martha Berry, “Letter to Nelle Morten from Martha Berry.” Martha Berry Digital Archive. Eds. Schlitz, Stephanie A., Aaron Jackson, Chelsea Risley, et al. Mount Berry: Berry College, 2014. accessed April 21, 2019, https://mbda.berry.edu/items/show/13494.